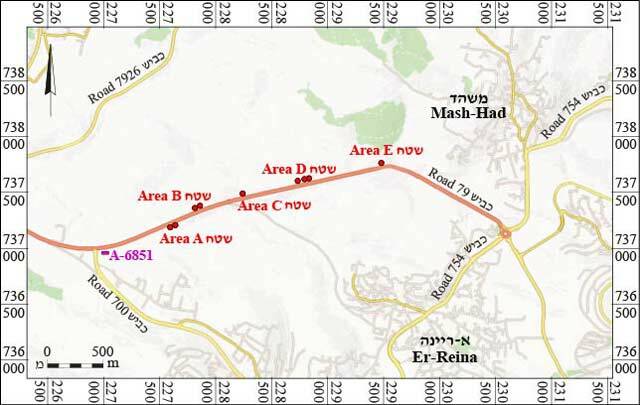 From October 2013 to February 2014, trial excavations were conducted along Highway 79 north of er-Reina village (Permit Nos. A-6904, A-6992; map ref. 22760–960/73702–80), prior to widening the road. The excavations, undertaken on behalf of the Israel Antiquities Authority and financed by the Israel National Roads Company Ltd., were directed by O. Zidan (photography), with the assistance of Y. Yaʽaqobi (administration), R. Mishayev and M. Kahan (surveying and drafting), A. Shapiro (GPS), H. Tahan-Rosen (pottery drawing) and W. Atrash and T. Horowitz (scientific guidance). Five excavation areas (A–E; Fig. 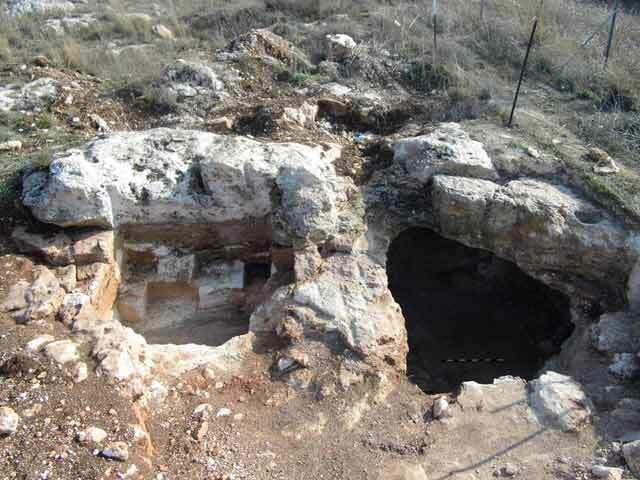 1) were opened along Highway 79 between Avihu Junction and Mash-had Junction, yielding the following antiquities: a burial cave dating to the Intermediate Bronze Age, a winepress and walls from the Late Roman period, a cave where limestone blocks were quarried for the production of lime dated to the Roman and Byzantine periods and a limekiln. 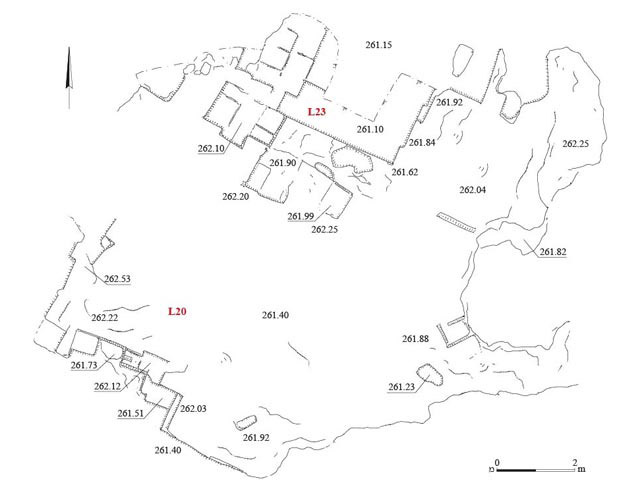 The excavation areas were opened where ancient remains were documented in a 2009 survey (Permit No. S-153/2009: Sites 3, 6, 12–16). Area A (Fig. 2). In the 1990s, the northern part of the area was damaged due to the construction of Highway 79, and several burial caves were partially destroyed. The excavation in this area yielded a rock-hewn burial cave ascribed to the Intermediate Bronze Age, pottery sherds from the Early Roman period and a rock-cut winepress from the Late Roman period. 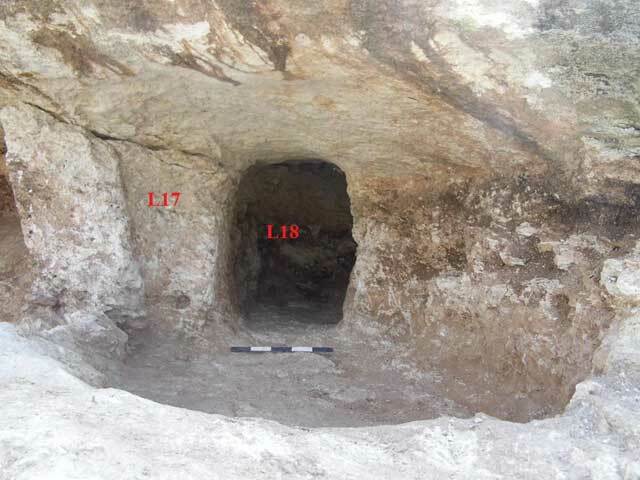 The burial cave from the Intermediate Bronze Age included an entrance shaft (L14) and four burial chambers (L15–L18) hewn in a bedrock outcrop. The northern part of the cave was destroyed during the construction of the road. 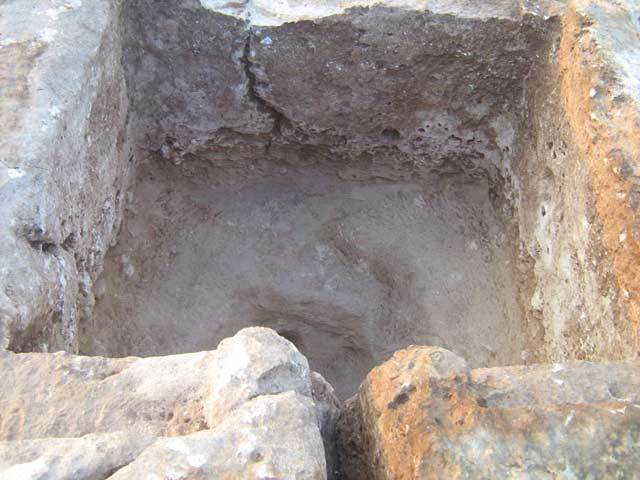 The entrance shaft was square (1 × 1, depth 2 m; Fig. 3); it was blocked with light brown alluvium mixed with a large amount of small stones and Roman-period pottery sherds. At the bottom of the shaft was a hewn tunnel leading to Burial Chamber 16, the main burial room (Fig. 4). Openings cut in the eastern and western walls of Chamber 16 led into Burial Chambers 15 and 17. 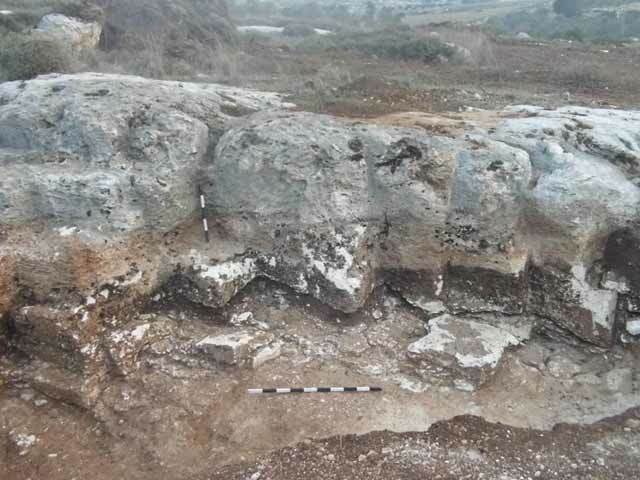 An accumulation of crushed calcareous material, probably from the destruction of the northern part of the cave, was revealed in Chambers 15 and 16. Chamber 17 was rectangular; a tunnel hewn in its southern wall led to Burial Chamber 18 (Fig. 5), which was fully preserved. 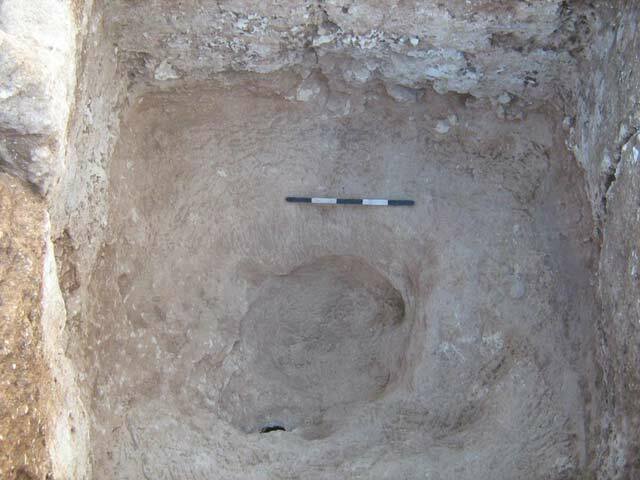 A layer of light gray soil that contained several bones and pottery sherds from the Intermediate Bronze Age, including four jugs (Fig. 6:1–4) and a teapot (Fig. 6:5), was discovered in Chambers 17 and 18. Dark brown soil (L10, L11, L13) mixed with pottery sherds from the Early Roman period, including fragments of a cooking pot (Fig. 6:6) and a jar (Fig. 6:7), were found while cleaning the bedrock outcrop that had sustained damage during the construction of the road. 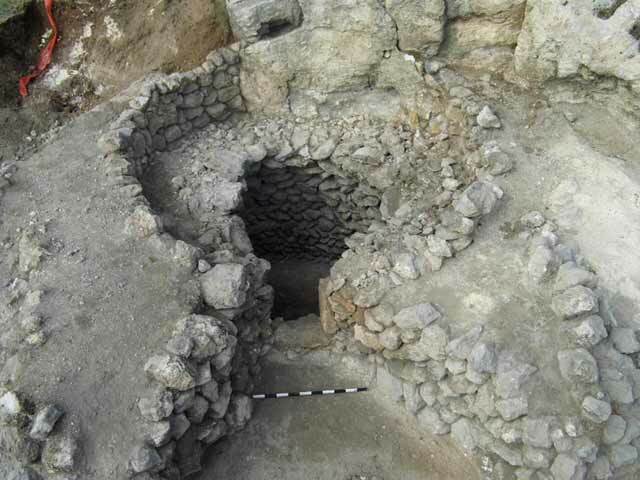 The winepress ascribed to the Late Roman period, was hewn in a bedrock outcrop above the burial cave. Only the installation’s collecting vat (L12; 1.5 × 1.5 m, depth 1.2 m; Figs. 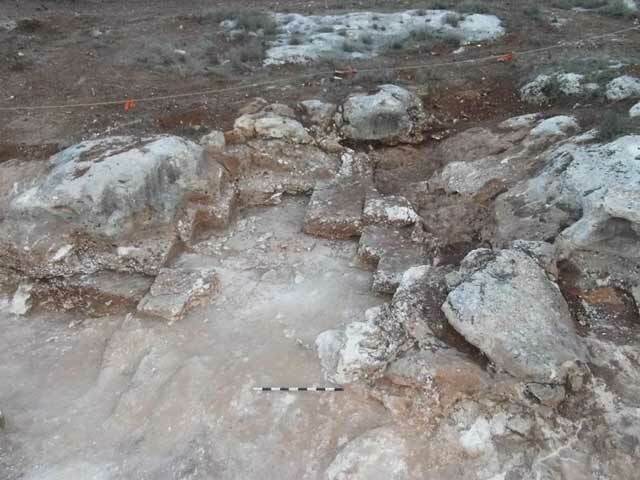 3, 7) was preserved; the northern part of the winepress had been destroyed during the road construction. A sump (diam. c. 0.4 m, depth 0.2 m) was hewn at the center of the vat’s floor, and a channel that extended from the northern side of the vat probably led from the treading floor; the treading floor, however, did not survive (Fig. 8). The collecting vat was blocked with light brown alluvium mixed with a large amount of small stones and sherds that date to the Late Roman period, including a krater (Fig. 6:9), a cooking pot (Fig. 6:13) and two jars (Fig. 6:14, 15). Area B. A cave (L26; diam. 5 m, depth c. 1.5 m; Figs. 9, 10) quarried in the soft limestone rock in the eastern part of the area provided limestone blocks for the production of lime. 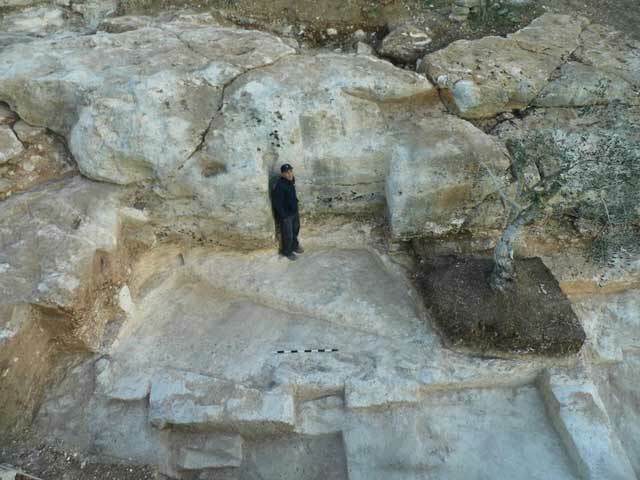 A quarry (L25) consisting of four quarrying steps was found north of the cave. Apparently, the stones hewn had no uniform size. A scant amount of abraded pottery sherds from the Late Roman and Byzantine periods was discovered in the quarry. Another quarry (L20, L23; 160 sq m; Figs. 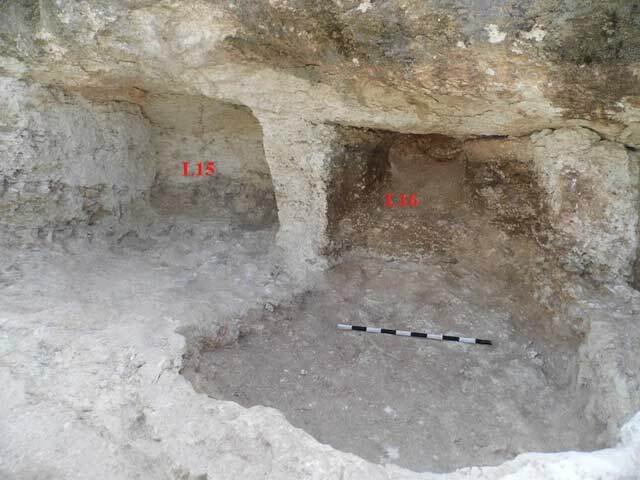 11, 12) was in the western part of the excavation area. It also consisted of four quarrying steps. The chisel marks indicate that medium-sized stones (0.3 × 0.4 × 0.5 m) were produced there. A layer of bonded quarrying debris found at the bottom of the quarry indicates that the final dressing of the stones was done on site. Several worn pottery sherds from the Roman period were discovered in this layer. Two parallel walls (W20, W27; Figs. 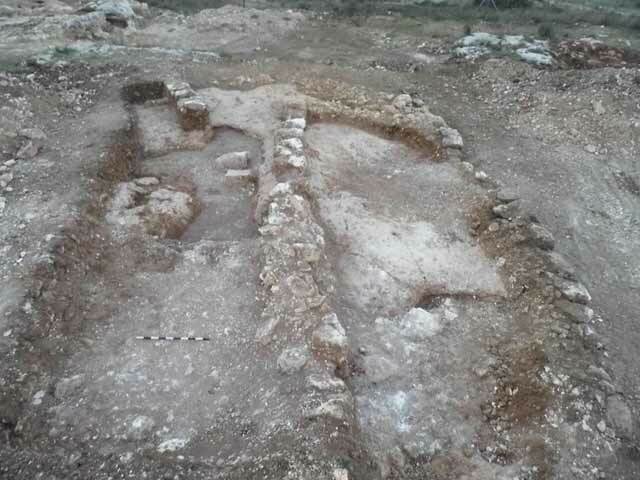 13, 14), situated 2.7 m apart, were uncovered in the northern part of the area. Both were founded on a bedrock surface and built of one row of limestone blocks (0.5 × 0.8 m), some of which were dressed. Soil (L21, L30, L32) containing a large amount of small stones and pottery sherds from the Late Roman period, including a bowl (Fig. 6:8) and a saqiye jar (Fig. 6:16), had accumulated between and above the two walls. 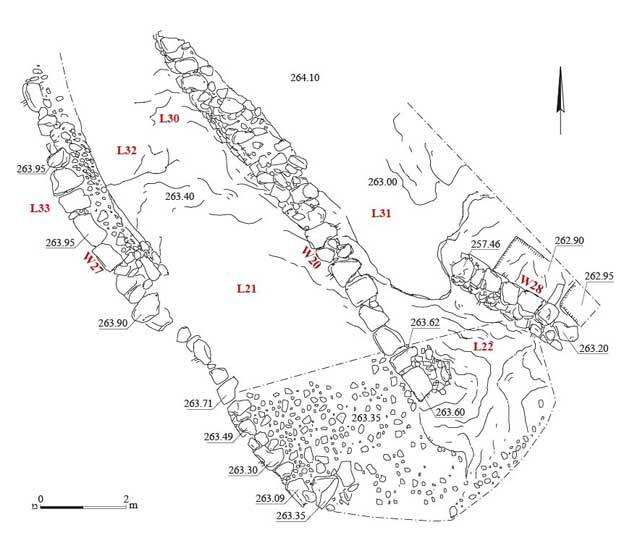 East of the two walls, but not parallel to them, was another wall (W28; preserved length 1.5 m, width 0.7 m; Fig. 15). It was built of medium-sized ashlars, preserved to a height of three courses and founded on the limestone bedrock that bore signs of quarrying. 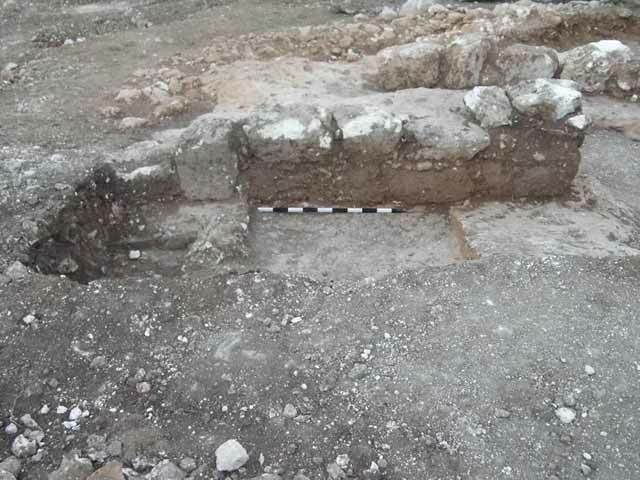 On either side of the wall was a layer of light gray soil (L22, L31) that yielded a large amount of small stones and pottery sherds from the Late Roman period, including three kraters (Fig. 6:10–12) and two jars (Fig. 6:17, 18). Area C. A limekiln (diam. 3.0–3.5 m; Figs. 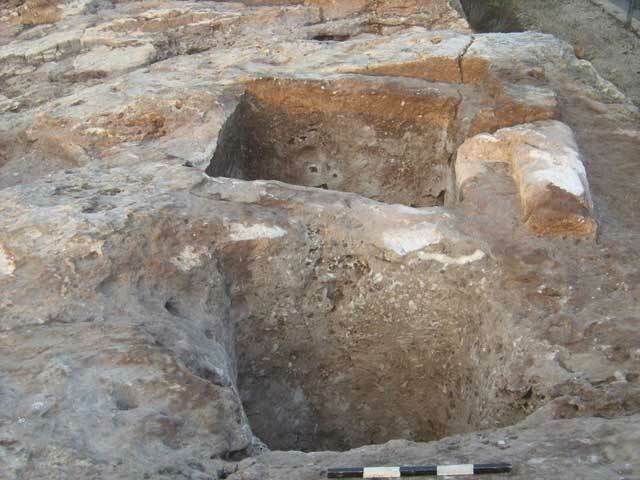 16, 17) built of fieldstones (0.2 × 0.3 m) alongside a bedrock wall was exposed. A retaining wall (width c. 0.6 m) was constructed of medium-sized fieldstones around the kiln. The stones in the bottom courses of the kiln were burnt as a result of the intense heat that was generated when the installation was in operation. 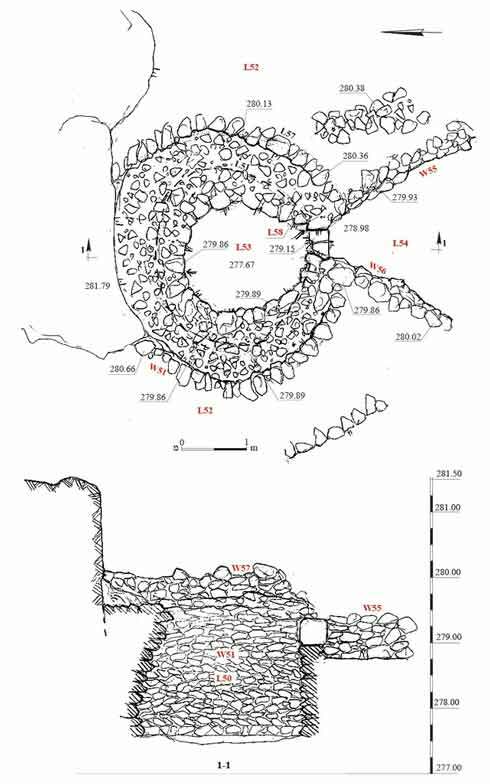 The kiln’s stokehole was funnel-shaped and faced southward (Fig. 18). No datable finds were discovered in the kiln; hence it was not possible to determine the time of its use. 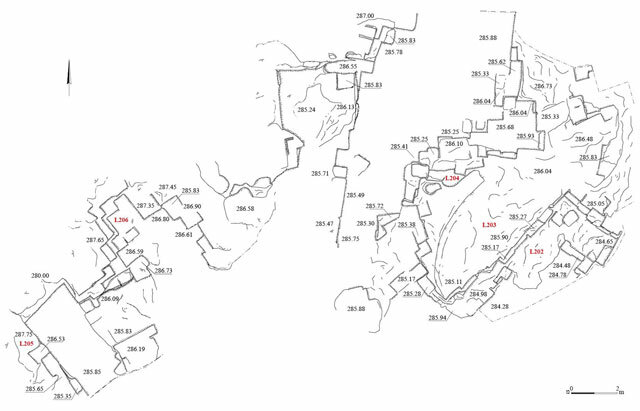 Area D. A quarry (L200; 20 sq m; Figs. 19, 20) consisting of four quarrying steps with vertical walls was discovered in the western part of the area. The presence of chisel marks indicates that medium-sized stones (0.25 × 0.30 × 0.40 m) were produced there. A layer of bonded quarrying debris (thickness 1.4 m) was found at the bottom of the quarry, indicating that the final dressing of the stones was done on site. A large quarry (c. 300 sq m; Figs. 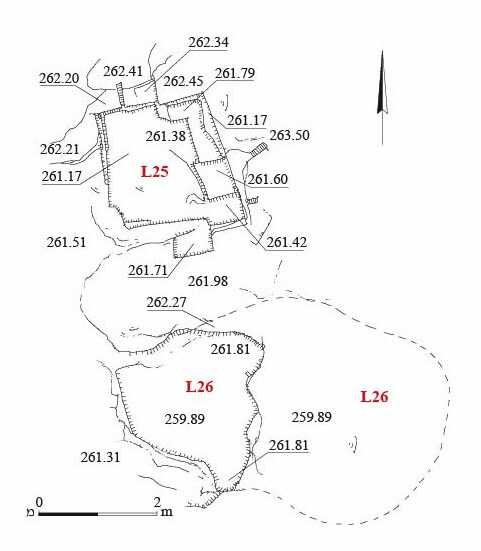 21, 22) comprising no more than four quarrying steps was exposed in the eastern part of Area D. The chisel marks indicate that various-sized stones were produced there. A layer of bonded quarrying debris found at the bottom of that quarry similarly indicating that the final dressing of the stones was done on site. Pottery sherds dating to the Byzantine period were revealed in this layer. Area E. A quarry (100 sq m; Fig. 23) comprising up to four quarrying steps was unearthed. The chisel marks show that various-sized stones were produced there. A layer of bonded quarrying debris on the quarry floor indicates that the final dressing of the stones was done on site. No datable finds were discovered. 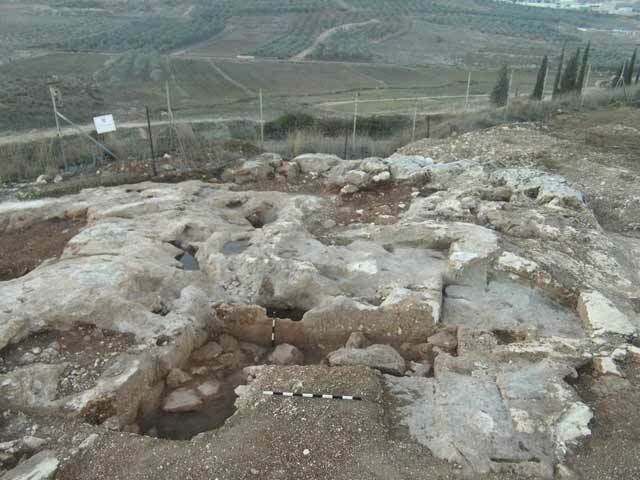 The finds revealed in the excavation indicate that the excavation areas were part of the agricultural hinterland and industrial area of the nearby settlements during the Roman and Byzantine periods, such as Zippori, er-Reina and Gat Hefer (Mash-had). 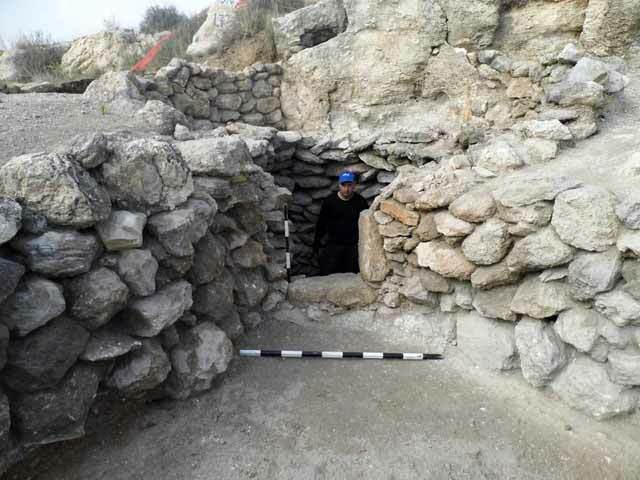 The burial cave from the Intermediate Bronze Age reflects the activity that transpired in the region during this period. 3. The opening of the entrance shaft to the burial cave (in the foreground) and a collecting vat, looking west. 4. Chambers 15 and 16 in the burial cave, looking south. 5. Chambers 17 and 18 in the burial cave, looking south. 7. Collecting Vat 12, looking south. 8. Collecting Vat 12 and the channel leading to it, looking north. 9. 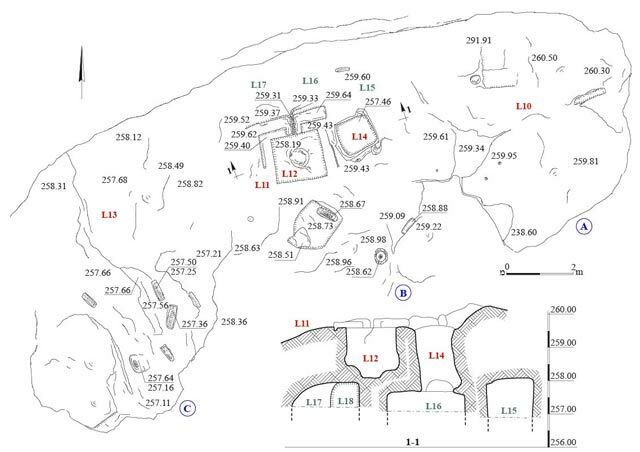 Cave 26 and Quarry 25, plan. 10. The entrance to Cave 26 (right) and Quarry 25, looking east. 11. Area B, western quarry, plan. 12. Area B, western quarry, looking south. 13. Walls 20, 27 and 28, plan. 14. Walls 20, 27 and 28, looking south. 15. Wall 28, looking west. 18. The opening of the kiln’s stokehole, looking north. 20. Quarry 200, looking north. 21. 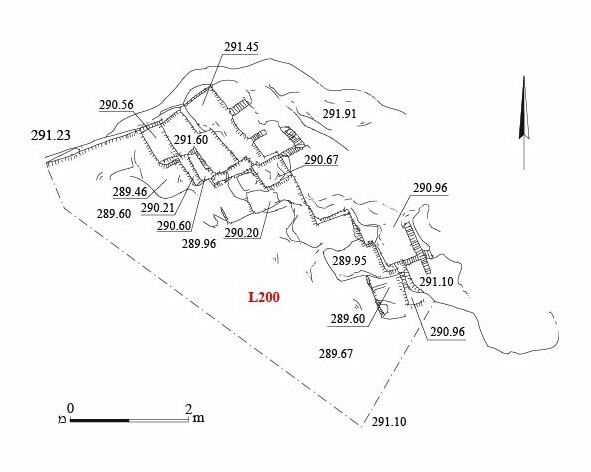 Area D, eastern quarry, plan. 22. Area D, eastern quarry, looking north. 23. Area E, quarry, looking north.